The Nicole by OPI Scandalous! Neons collection was sent for review. All opinions are my own honest thoughts. Today I have swatches of the Nicole by OPI Scandalous! Neons. I am pleased to report that these three have much better formulas than the Notorious! Neons! 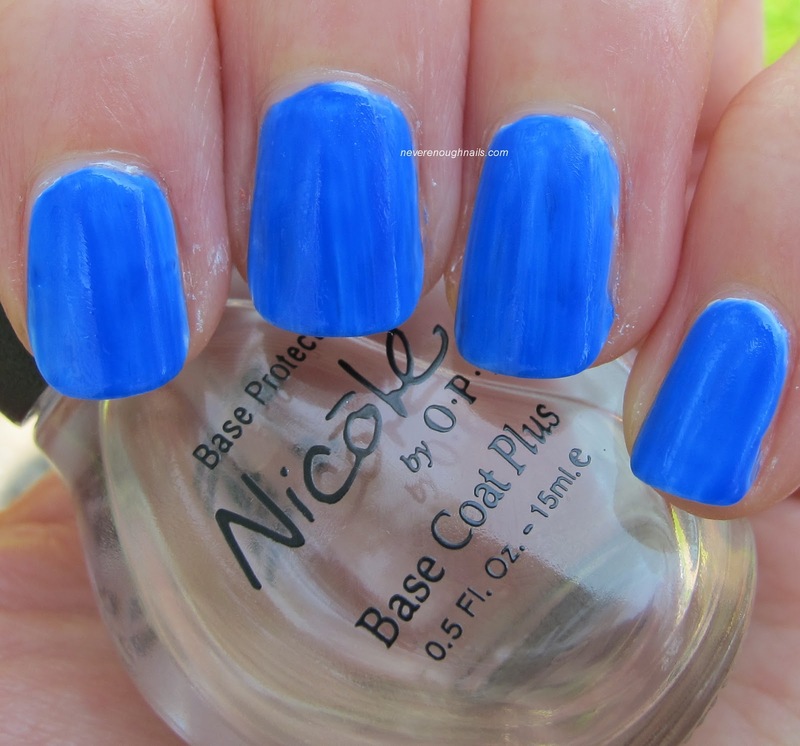 First up, we have Nicole by OPI Blue Neon. 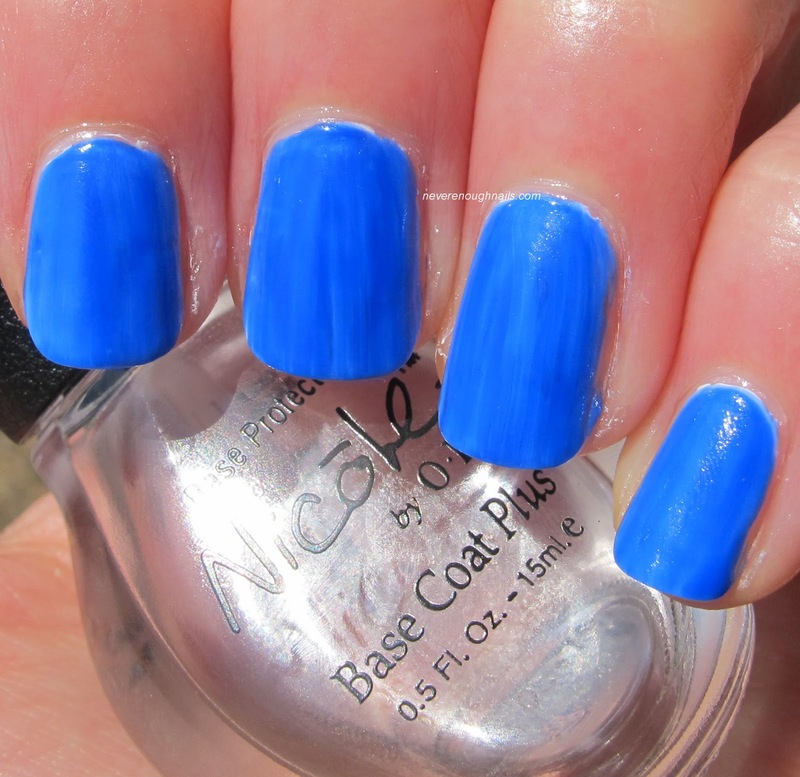 Blue Neon is a very bright neon blue, it kind of reminds me of a lighter less saturated Rescue Beauty Lounge IKB: 2012. Now in the bright sunshine, Blue Neon looks streaky, but in most lights it looked mostly even. There was still a bit of streaking, but not terrible. More on the normal side for neons. I only needed two coats over the white base. The Nicole by OPI Scandalous! Neon collection was sent for review. All opinions are my own honest thoughts. 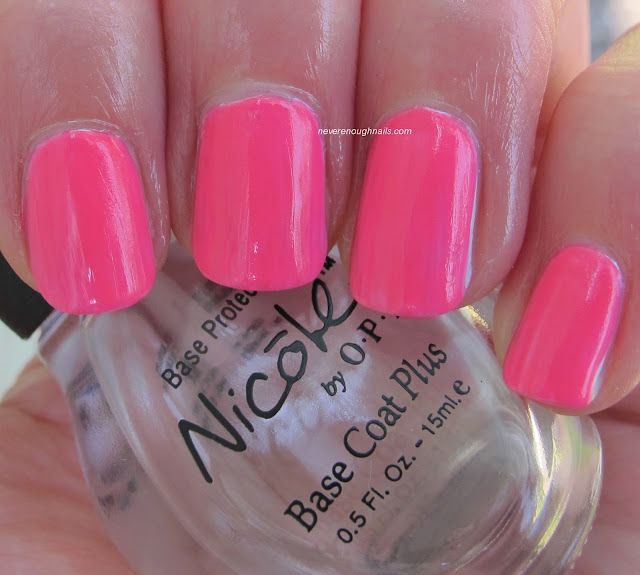 I am not really sure if I would call Nicole by OPI Purple Neon a true neon or not. It is a bright medium purple, but I don't really think it's neon bright. It looks different depending on what light you're in. In the sun it washes out to look more like a regular medium purple creme. In shadow, it looks more like a bright blue-purple (you can see in the last picture, it looks like a different polish!). It's definitely very pretty, just not the most neon polish I've ever seen. I needed two coats of Purple Neon over two coats of the white base for evenness. I found Purple Neon to be pretty smooth to apply, it wasn't a total challenge to keep it streak-free. 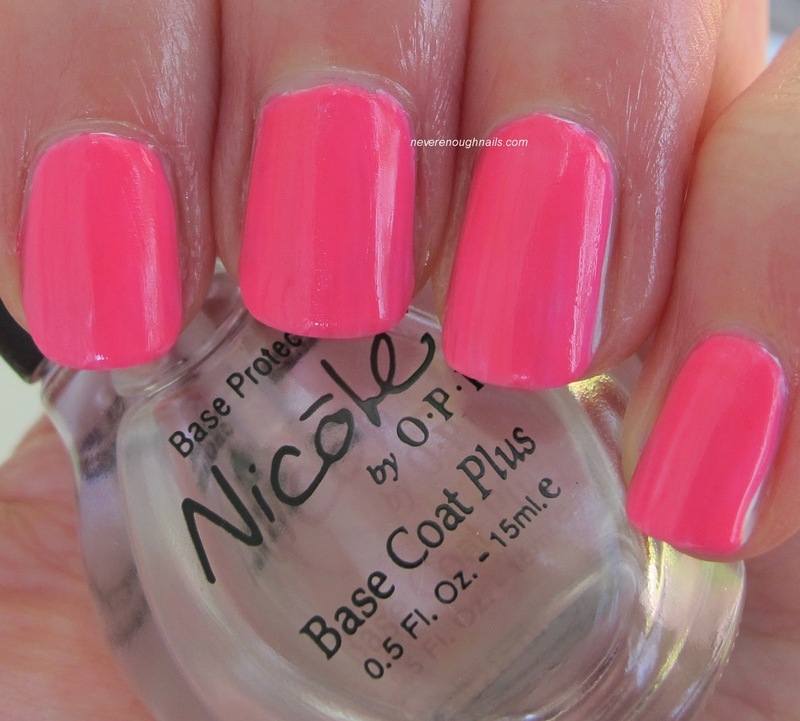 Nicole by OPI Pink Neon is probably my favorite polish in both of the two neon mini sets! I know I'm always talking about how I don't really love pink polish, but I do love a good pink neon polish! Pink Neon is very bright and electric looking. It's not too cool or blue-leaning, so it should look good on all skin tones, not just the cool ladies. I used two coats of Pink Neon over two coats of the white base. I found Pink Neon to apply pretty evenly and smoothly. It was the easiest to use of the Nicole by OPI Neons. Of these two mini sets, Pink Neon and Orange Neon were the best performing polishes. Purple and Blue were fairly good too. I had trouble with Fuchsia and Green applying streakily and I was also not really a fan of the white base included in the sets. I would probably use a different white creme next time, maybe OPI Alpine Snow. 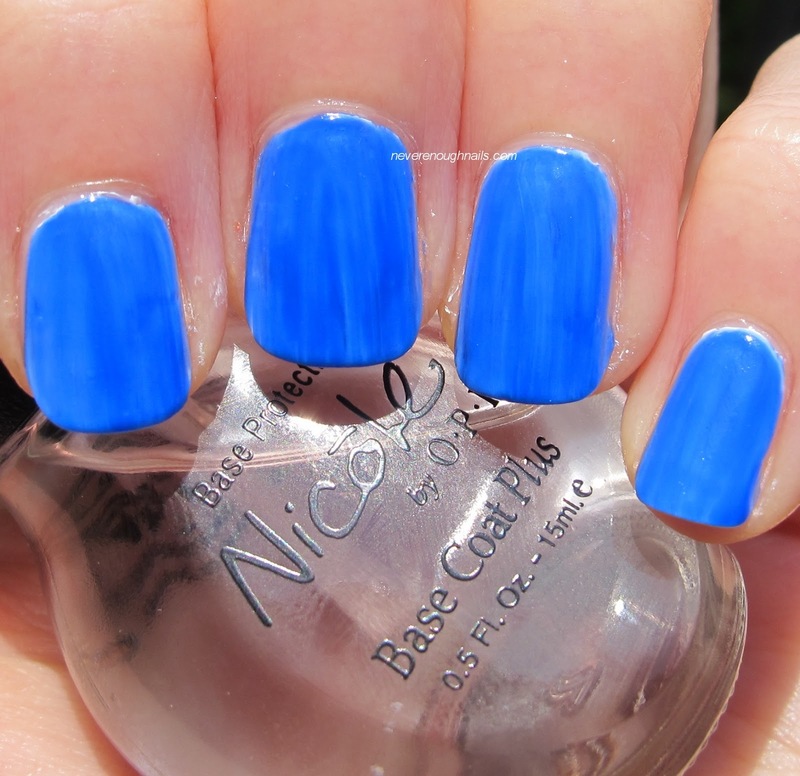 The Nicole by OPI Scandalous! Neons are available now at retailers including Meijer, CVS, Duane Reade, H-E-B, Kroger, and ShopKo. Each Neon set is $10.